With their second insane stunt video on these crazy dirt bike/snowmobile hybrids, Red Bull has officially created the job title “professional snow biker.” And here I was thinking I had a cool job. The snow bike as we see it here was basically born in 2010. 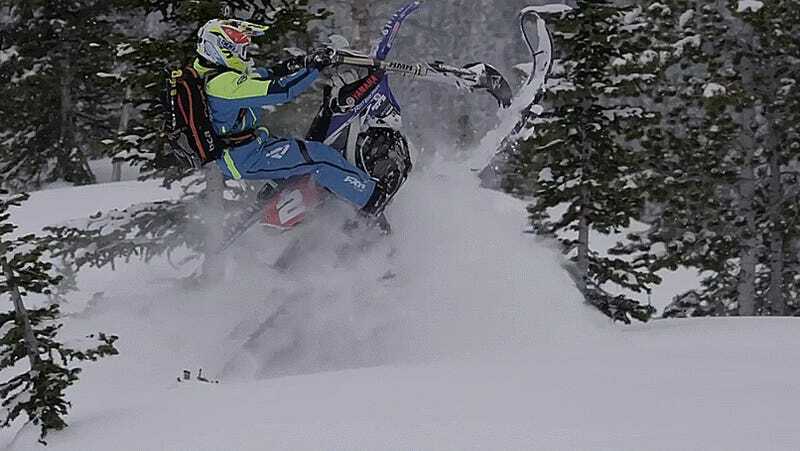 The machines ridden in this video are made by Timbersleds, an outfit which has effectively established itself as the preeminent snow bike brand, for the time being, by getting their products ridden by Brock Hoyer, Reagan Sieg and Ronnie Renner. Those guys all come from the motocross, freestyle and all-out asskicking-on-dirt-bikes world. They’ve since been knighted as professional snow bikers and we’re now seeing the second wild Red Bull video of these hybrid machines in action. As you can see the bikes have no wheels at all. The front is swapped for a ski that’s a healthy 10 inches wide while the tread is 10.5 inches fat and 120 inches long. It’s “designed with a convex shape, and each paddle is longer in the center and shorter on the sides, which gives it the feel of a dirt bike tire,” as Red Bull explains. The suspension allows for three different settings and positions to change the snow bike’s handling and personality. That kit is simply slapped on to standard dirt bikes with, obviously, as much horsepower as possible. So I guess that means we can expect more well-funded snow bike stunts on video. Think this will catch on to get anywhere near as popular as standard snowmobiles or dirt bikes?